A dramatic health-related revolution is taking place in society – affecting healthcare, life sciences, public sector, higher education, insurance and consumer products. Automated diagnosis, the empowerment of the patient, the advance of genomics and the need and capability to analyze massive amounts of big data: all of these drive innovation to improve drug-, therapy-, and medical device-development. SAP is uniquely positioned to help advance personalized medicine. Its sophisticated platforms and advanced analytic solutions can help unlock the value of data – from genome to electronic medical record to clinical trial. By facilitating integration, real-time analysis, and reporting of biomedical data, SAP solutions support insights that ultimately lead to better patient outcomes. Learn about exciting new SAP technology and products: SAP Foundation for Health, SAP Medical Research Insights and SAP Health Engagement are in use at customers. 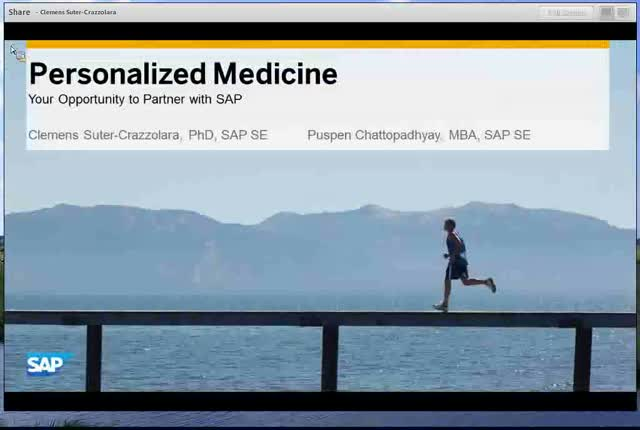 These products will enable new and existing SAP partners to join SAP on the personalized medicine journey.